Sometime ago I wrote a preview about the upcoming works of famed sci-fi author Alastair Reynolds. Well, fans of his writing can look forward to even more of his stories. 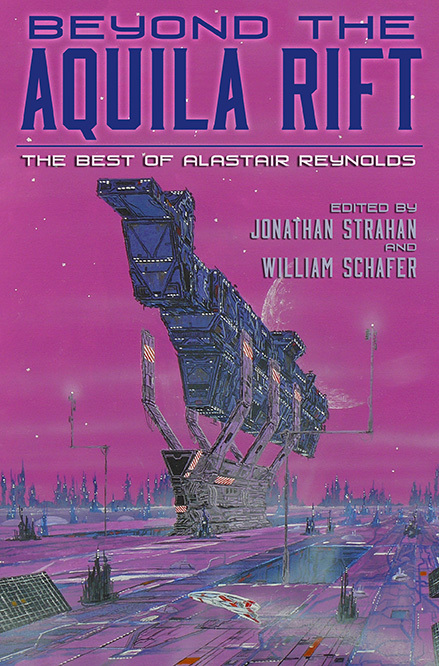 First up is BEYOND THE AQUILA RIFT: THE BEST OF ALASTAIR REYNOLDS. This is a collection of the author’s short fiction and novellas. For those readers unfamiliar with the author, Aquila Rift is his nomme de plume or alter ego. Reynolds has a long history of writing short fiction, publishing them in the most unlikely magazines besides those well known such as Interzone. Reynolds has previously published short fiction collections, those set in the Revelation Space universe being particularly popular. Now readers can get all of his short fiction in one book. Die hard fans of Alastair Reynolds can purchase various editions of BEYOND THE AQUILA RIFT. I am not certain how the Lettered versions are distributed, but I am definitely getting the Limited edition. BEYOND THE AQUILA RIFT is scheduled for release in June and will only be available in limited quantities. At 786 pages it is quite enormous, but you can pre-order a copy now at the publishers. For a rundown of all the short stories and novella’s included just follow the link to outthrebook. In the meantime the authors output has not slowed down. Yesterday he announced on Twitter he had sold a short story set in the House of Suns universe. “Just throwing this out there as a tease now, but I’ve sold a new story … and it’s set in the House of Suns universe.”. No word yet on a release date or to whom he sold the story. 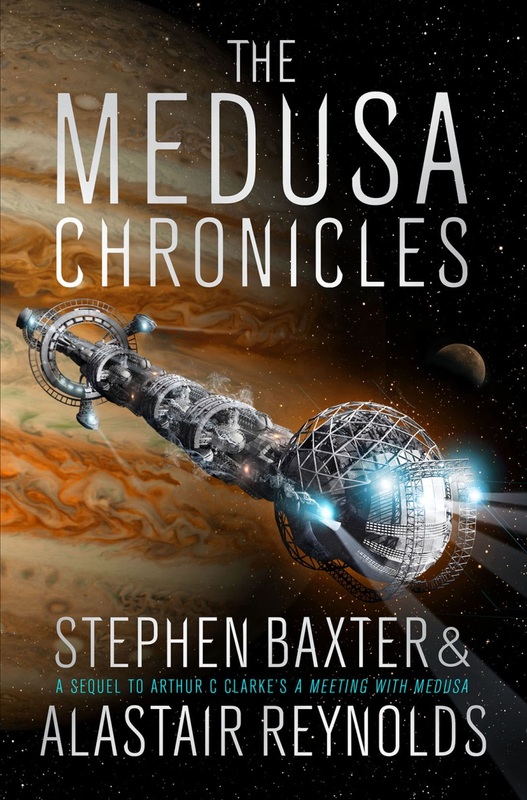 Of course the big release everybody is looking forward to is The Medusa Chronicles, co-written with Stephen Baxter. It is a sequel to A Meeting With Medusa, a novel written by Arthur C. Clarke. I had earlier noted down the release to be in late February, but on the Amazon page it set for May 19th. That is for the Kindle edition. A hardback copy is set for June 7th. There is, however, a synopsis available. Inspired by Sir Arthur C. Clarke’s short story A Meeting with Medusa, this novel, with permission from the Clarke Estate, continues the story of Commander Howard Falcon over centuries of space-exploration, interaction with AI, first contact and beyond. All brought to life by two of our greatest SF authors, Stephen Baxter and Alastair Reynolds. Howard Falcon almost lost his life in an accident . . . and a combination of human ingenuity and technical expertise brought him back. Not as himself, but as an augmented human: part man, part machine, and exceptionally capable. The Medusa Chronicles charts his journey through time, the changing interaction between humanity and our universe, and combined moments of incredible action with unparalleled exploration of and expansion into space. A compelling read from the beginning, this is classic SF which has appeal for readers who like Gravity and The Martian. Some Criticism of Alastair Reynolds. As much as I am fan of Alastair Reynolds, no author writes without receiving criticism. Only recently did I finally finish Poseidon’s Wake after I got it last April. The story started somewhat slowly, which is the reason I put it down, but ended on a dark high note. On Facebook there was a discussion over the last few days as to what is wrong with the Poseidon trilogy. Here is my take. Despite the effort the author has put in all three novels of the Poseidon trilogy they are his lesser work. The author feels the need to tick certain boxes: visit the Moon, visit Mars, create hard-SF. Yet, it cannot compare to Revelation Space. At times it is not easy to say exactly why. The gender neutral depiction of the future world is clever but a lot of the story feels too familiar. When reading Revelation Space and Chasm City there were times I felt disconnected from reality. RS became my new reality. I was Mirabel Tanner/ Sky Haussmann. I cannot say the same for the characters of Poseidon. The author has yet to emulate his success found with Terminal World in 2010. I hope readers of this post can understand the spirit in which I give this criticism. With Beyond the Aquila Rift and The Medusa Chronicles I hope to uncover his secret recipe. Next story A full release schedule of Star Trek Novels in 2016!